In the study of criminal psychology one is forced to the conclusion that the most dangerous of all types of mind is that of the inordinately selfish man. He is a man who has lost his sense of proportion. His own will and his own interest have blotted out for him the duty which he owes to the community. Impulsiveness, jealousy, vindictiveness are the fruitful parents of crime, but the insanity of selfishness is the most dangerous and also the most unlovely of them all. Sir Willoughby Patterne, the eternal type of all egoists, may be an amusing and harmless character as long as things go well with him, but let him be thwarted—let the thing which he desires be withheld from him, and the most monstrous results may follow. Huxley has said that a man in this life is for ever playing a game with an unseen opponent, who only makes his presence felt by exacting a penalty every time one makes a mistake in the game. The player who makes the mistake of selfishness may have a terrible forfeit to pay — but the unaccountable thing in the rules is that some, who are only spectators of his game, may have to help him in the paying. Read the Story of William Godfrey Youngman, and see how difficult it is to understand the rules under which these penalties are exacted. Learn also from it that selfishness is no harmless peccadillo, but that it is an evil root from which the most monstrous growths may spring. About forty miles to the south of London, and close to the rather passé watering-place of Tunbridge Wells, there lies the little townlet of Wadhurst. It is situated within the borders of Sussex at a point which is close to the confines of Kent. The country is a rich pastoral one and the farmers are a flourishing race, for they are near enough to the Metropolis to take advantage of its mighty appetite. Among these farmers there lived in the year 1860 one Streeter, the master of a small homestead and the father of a fair daughter, Mary Wells Streeter. Mary was a strong, robust girl, some twenty years of age, skilled in all country work, and with some knowledge also of the town, for she had friends up there, and above all she had one friend, a young man of twenty-five, whom she had met upon one of her occasional visits, and who had admired her so that he had actually come down to Wadhurst after her, and had spent a night under her father’s roof. The father had expressed no disapprobation of the suitor, a brisk, masterful young fellow, a little vague in his description of his own occupation and prospects, but an excellent fireside companion. And so it came about that the deep, town-bred William Godfrey Youngman became engaged to the simple, country-bred Mary Wells Streeter, William knowing all about Mary, but Mary very little about William. 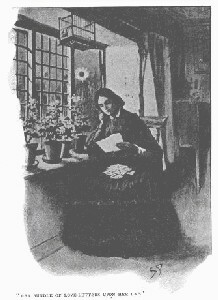 July the 29th of that year fell upon a Sunday, and Mary sat in the afternoon in the window of the farm-house parlour, with her bundle of love-letters upon her lap, reading them again and yet again. Outside was the little square of green lawn, fringed with the homely luxuriance of an English country garden, the high hollyhocks, the huge nodding sunflowers, the bushes of fuchsia, and the fragrant clumps of sweet William. Through the open lattice came the faint, delicate scent of the lilac and the long, low droning of the bees. The farmer had lain down to the plethoric sleep of the Sunday afternoon, and Mary had the room to herself. There were fifteen love-letters in all some shorter, some longer, some wholly delightful, some with scattered business allusions, which made her wrinkle her pretty brows. There was this matter of the insurance, for example, which had cost her lover so much anxiety until she had settled it. No doubt he knew more of the world than she, but still it was strange that she, so young and so hale, should be asked and again asked to prepare herself for death. Even in the flush of her love those scattered words struck a chill to her heart. “Dearest girl,” he had written, “I have filled up the paper now, and took it to the life insurance office, and they will write to Mrs. James Boric today to get an answer on Saturday. So you can go to the office with me before two o’clock on Monday.” And then again, only two days later, he had begun his letter: “You promised me faithfully over and over again, and I expect you to keep your promise, that you would be mine, and that your friends would not know it until we were married; but now, dearest Mary, if you will only let Mrs. James Bone write to the insurance office at once and go with me to have your life insured on Monday morning next!“ So ran the extracts from the letters, and they perplexed Mary as she read them. But it was all over now, and he should mingle business no longer with his love, for she had yielded to his whim, and the insurance for £100 had been duly effected. It had cost her a quarterly payment of 10s. 4d., but it had seemed to please him, and so she would think of it no more. “16, Manor Place, Newington, S.E. A very pressing invitation this to a merry day in town; but there were certainly some curious phrases in it. What did he mean by saying that he would manage things as he expected to do? And why should she burn or bring her love-letters? There, at least, she was determined to disobey this masterful suitor who always “expected” in so authoritative a fashion that she would do this or that. Her letters were much too precious to be disposed of in this off-hand fashion. She packed them back, sixteen of them now, into the little tin box in which she kept her simple treasures, and then ran to meet her father, whose step she heard upon the stairs, to tell him of her invitation and the treat which awaited her to-morrow. At a quarter to ten next morning William Godfrey Youngman was waiting upon the platform of London Bridge Station to meet the Wadhurst train which was bringing his sweetheart up to town. No observer glancing down the straggling line of loiterers would have picked him out as the man whose name and odious fame would before another day was passed be household words to all the three million dwellers in London. In person he was of a goodly height and build, but commonplace in his appearance, and with a character which was only saved from insignificance through the colossal selfishness, tainted with insanity, which made him conceive that all things should bend before his needs and will. So distorted was his outlook that it even seemed to him that if he wished people to be deceived they must be deceived, and that the weakest device or excuse, if it came from him, would pass unquestioned. He had been a journeyman tailor, as his father was before him, but aspiring beyond this, he had sought and obtained a situation as footman to Dr. Duncan, of Covent Garden. Here he had served with credit for some time, but had finally resigned his post and had returned to his father’s house, where for some time he had been living upon the hospitality of his hard-worked parents. He had talked vaguely of going into farming, and it was doubtless his short experience of Wadhurst with its sweet-smelling kine and Sussex breezes which had put the notion into his Cockney head. But now the train rolls in, and there at a third-class window is Mary Streeter with her pink country cheeks, the pinker at the sight of her waiting lover. 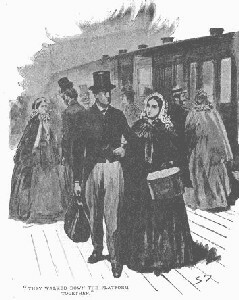 He takes her bag and they walk down the platform together amongst the crinolined women and baggy-trousered men whose pictures make the London of this date more strange to us than that of last century. He lives at Walworth, in South London, and a straw-strewn omnibus outside the station conveys them almost to the door. It was eleven o’clock when they arrived at Manor Place, where Youngman’s family resided. The household arrangements at Manor Place were peculiar. The architect having not yet evolved the flat in England, the people had attained the same result in another fashion. The tenant of a two-storied house resided upon the ground-floor, and then sub-let his first and second floors to other families. Thus, in the present instance, Mr. James Bevan occupied the ground, Mr. and Mrs. Beard the first, and the Youngman family the second, of the various floors of No. 16. Manor Place. The ceilings were thin and the stairs were in common, so it may be imagined that each family took a lively interest in the doings of its neighbour. Thus Mr. and Mrs. Beard of the first floor were well aware that young Youngman had brought his sweetheart home, and were even able through half-closed doors to catch a glimpse of her, and to report that his manner towards her was affectionate. It was not a very large family to which he introduced her. The father departed to his tailoring at five o’clock every morning and returned at ten at night. There remained only the mother, a kindly, anxious, hard-working woman, and two younger sons aged eleven and seven. At eleven o’clock the boys were at school and the mother alone. She welcomed her country visitor, eyeing her meanwhile and summing her up as a mother would do when first she met the woman whom her son was likely to marry. They dined together, and then the two set forth to see something of the sights of London. No record has been left of what the amusements were to which this singular couple turned: he with a savage, unrelenting purpose in his heart; she wondering at his abstracted manner, and chattering country gossip with the shadow of death already gathering thickly over her. One little incident has survived. One Edward Spicer, a bluff, outspoken publican who kept the Green Dragon in Bermondsey Street, knew Mary Streeter and her father. The couple called together at the inn, and Mary presented her lover. We have no means of knowing what repellent look mine host may have observed in the young man’s face, or what malign trait he may have detected in his character, but he drew the girl aside and whispered that it was better for her to take a rope and hang herself in his skittle-alley than to marry such a man as that—a warning which seems to have met the same fate as most other warnings received by maidens of their lovers. In the evening they went to the theatre together to see one of Macready’s tragedies. How could she know as she sat in the crowded pit, with her silent lover at her side, that her own tragedy was far grimmer than any upon the stage? It was eleven o’clock before they were back once more at Manor Place. The hard-working tailor had now returned, and the household all supped together. Then they had to be divided for the night between the two bedrooms, which were all the family possessed. The mother, Mary, and the boy of seven occupied the front one. The father slept on his own board in the back one, and in a bed beside him lay the young man and the boy of eleven. So they settled down to sleep as commonplace a family as any in London, with little thought that within a day the attention of all the great city would be centred upon those two dingy rooms and upon the fates of their inmates. The father woke in the very early hours, and saw in the dim light of the dawn the tall figure of his son standing in white beside his bed. To some sleepy remark that he was stirring early the youth muttered an excuse and lay down once more. At five the tailor rose to his endless task, and at twenty minutes past he went down the stair and closed the hall door behind him. So passed away the only witness, and all that remains is conjecture and circumstantial evidence. No one will ever know the exact details of what occurred, and for the purpose of the chronicler it is as well, for such details will not bear to be too critically examined. The motives and mind of the murderer are of perennial interest to every student of human nature, but the vile record of his actual brutality may be allowed to pass away when the ends of justice have once been served by their recital. I have said that on the floor under the Youngman’s there lived a couple named Beard. At half-past five, a little after the time when the tailor had closed the hall door behind him, Mrs. Beard was disturbed by a sound which she took to be from children running up and down and playing. There was a light patter of feet on the floor above. But as she listened it struck her that there was something unusual in this romping at so early an hour, so she nudged her husband and asked him for his opinion. Then, as the two sat up in bed, straining their ears, there came from above them a gasping cry and the dull, soft thud of a falling body. Beard sprang out of bed and rushed upstairs until his head came upon the level of the Youngman’s landing. He saw enough to send him shrieking down to Mr. Bevan upon the ground-floor. “For God’s sake, come here! There is murder!” he roared, fumbling with his shaking fingers at the handle of the landlord’s bedroom. His summons did not find the landlord entirely unprepared. That ill-boding thud had been loud enough to reach his ears. He sprang palpitating from his bed, and the two men in their nightdresses ascended the creaking staircase, their frightened faces lit up by the blaze of golden sunlight of a July morning. Again they do not seem to have got farther than the point from which they could see the landing. That confused huddle of white-clad figures littered over the passage, with those glaring smears and blotches, were more than their nerves could stand. They could count three lying there, stark dead upon the landing. And there was someone moving in the bedroom. It was coming towards them. With horror-dilated eyes they saw William Godfrey Youngman framed in the open doorway, his white nightdress brilliant with ghastly streaks and the sleeve hanging torn over his hand. The two men did not stop to discuss the question with him. They had both rushed to their rooms and huddled on some clothes. Then they ran out of the house in search of a surgeon and a policeman, leaving Youngman still standing on the stair repeating his strange explanation. How sweet the morning air must have seemed to them when they were once clear of the accursed house, and how the honest milkmen, with their swinging tins, must have stared at those two rushing and dishevelled figures. But they had not far to go. 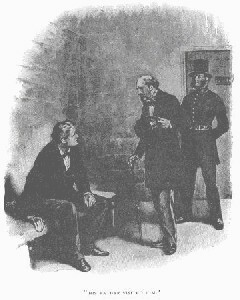 John Varney, of P Division, as solid and unimaginative as the law which he represents, was standing at the street corner, and he came clumping back with reassuring slowness and dignity. “Oh, policeman, here is a sight! What shall I do?” cried Youngman, as he saw the glazed official hat coming up the stair. Constable Varney is not shaken by that horrid cluster of death. His advice is practical and to the point. “Go and dress yourself!” said he. “I struck my mother; but it was in self defence,” cried the other. Constable Varney is not to be drawn into giving a legal opinion, but he is quite convinced that the best thing for Youngman to do is to put on some clothes. And now a crowd had begun to assemble in the street, and another policeman and an inspector had arrived. It was clear that, whether Youngman’s story was correct or not, he was a self-confessed homicide, and that the law must hold her grip of him. But when a dagger-shaped knife, splintered by the force of repeated blows, was found upon the floor, and Youngman had to confess that it belonged to him; when also it was observed that ferocious strength and energy were needed to produce the wounds inflicted, it became increasingly evident that, instead of being a mere victim of circumstances, this man was one of the criminals of a century. But all evidence must be circumstantial, for mother, sweetheart, brothers— the mouths of all were closed in the one indiscriminate butchery. The horror and the apparent purposelessness of the deed roused public excitement and indignation to the highest pitch. The miserable sum for which poor Mary was insured appeared to be the sole motive of the crime; the prisoner’s eagerness to have the business concluded, and his desire to have the letters destroyed in which he had urged it, forming the strongest evidence against him. At the same time, his calm assumption that things would be arranged as he wished them to be, and that the Argus Insurance Office would pay over the money to one who was neither husband nor relative of the deceased, pointed to an ignorance of the ways of business or a belief in his own powers of managing, which in either case resembled insanity. When in addition it came out at the trial that the family was sodden with lunacy upon both sides, that the wife’s mother and the husband’s brother were in asylums, and that the husband’s father had been in an asylum, but had become “tolerably sensible” before his death, it is doubtful whether the case should not have been judged upon medical rather than upon criminal grounds. In these more scientific and more humanitarian days it is perhaps doubtful whether Youngman would have been hanged, but there was never any doubt as to his fate in 1860. The trial came off at the Central Criminal Court upon August 16th before Mr. Justice Williams. Few fresh details came out, save that the knife had been in prisoner’s possession for some time. He had exhibited it once in a bar, upon which a bystander, with the good British love of law and order, had remarked that that was not a fit knife for any man to carry. Perhaps the objector did not realize how near he may have been at that moment to getting its point between his ribs. Nothing serious against the prisoner’s previous character came out at the trial, and he adhered steadfastly to his own account of the tragedy. In summing up, however, Justice Williams pointed out that if the prisoner’s story were true it meant that he had disarmed his mother and got possession of the knife. What necessity was there, then, for him to kill her—and why should he deal her repeated wounds? This argument, and the fact that there were no stains upon the hands of the mother, prevailed with the jury, and sentence was duly passed upon the prisoner. Youngman had shown an unmoved demeanour in the dock, but he gave signs of an irritable, and occasionally of a violent, temper in prison. His father visited him, and the prisoner burst instantly into fierce reproaches against his treatment of his family—reproaches for which there seem to have been no justification. Another thing which appeared to have galled him to the quick was the remark of the publican, which first reached his ears at the trial, to the effect that Mary had better hang herself in the skittle-yard than marry such a man. His self-esteem, the strongest trait in his nature, was cruelly wounded by such a speech. But in spite of exhortation and persuasion he carried his secret with him to the grave. He never varied from the story which he had probably concocted before the event. “Do not leave the world with a lie on your lips,” said the chaplain, as they walked to the scaffold. “Well, if I wanted to tell a lie I would say that I did it,” was his retort. He hoped to the end with his serene self-belief that the story which he had put forward could not fail eventually to be accepted. Even on the scaffold he was on the alert for a reprieve. It was on the 4th of September, a little more than a month after the commission of his crime, that he was led out in front of Horsemonger Gaol to suffer his punishment. A concourse of 30,000 people, many of whom had waited all night, raised a brutal howl at his appearance. It was remarked at the time that it was one of the very few instances of capital punishment in which no sympathizer or philanthropist of any sort could be found to raise a single voice against the death penalty. The man died quietly and coolly. And so, with the snick of a bolt and the jar of a rope, ended one of the most sanguinary, and also one of the most unaccountable, incidents in English criminal annals. 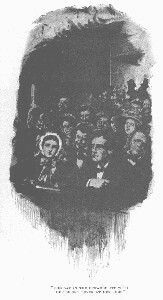 That the man was guilty seems to admit no doubt, and yet it must be confessed that circumstantial evidence can never be absolutely convincing, and that it is only the critical student of such cases who realizes how often a damning chain of evidence may, by some slight change, be made to bear an entirely different interpretation.